At some point during this walk do the walkers think "Why is this runway so short, when a longer runway would vastly improving the tourism economy, particularly in summer months?" Get a life, have a smile and see the good in something!!!! Kudos to the CIAA – Our airport may be in need of expansion but it is very safe – Well done folks and best wishes for the expansion when it happens. This isn't really news and should only be kept internally or for airport establishments. From the "Senior Manager", how many other "managers" safety management systems are there. I live close enough to know the airport do periodic runway inspections at various times throughout the day. I guess this annual FOD walk is to bring awareness to the importance of runway safety for all airport workers. All the better for Sunday morning fire truck racing. In all fairness to the unclear press release issued by the CIAA's Safety Manager, checks of runways and other aircraft operating areas are done at Owen Roberts Airport 4 times per day, every day, 365. The annual FOD walk is some creation of the Safety Department which is primarily for PR purposes. Guess the PR release backfired. Guess that's what happens when you seek to get noticed. Meanwhile, there is a family of black birds literally sitting in the shallow pond at the beginning of the runway… no joke. Go check for yourselves… you can see them as you drive on Crewe Rd, waiting to get sucked up into a jet engine! I hope they were on the lookout for driftwood aswell as debris! Wtf??? An annual F.O.D walk? I would have thought this would be completed daily considering the amount of traffic on the runway each day. This is scary! Are other airports operating this way? Yes they operate that way and also Santa is real….. read the article again…. WOW. only once a year? It is alarming that this is news! One would think this was routinely done. Annual!!!!!!!!!!!! Wow! Annual Foreign Object Debris (F.O.D) Walk……. ….."annual"; as in "once a year"…unnuh's wukin' too hard Bobo!!! 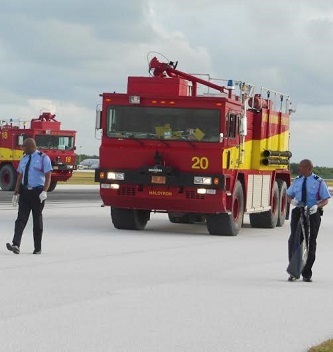 When I was an Air Traffic Contrioller in Barbados, it was the responsibility of ATC to drive the full length of the runway at least once a DAY looking for runway damage and debris. And in Cayman they do it once a YEAR? Here in the Cayman Islands it's done twice a day!!! Air traffic assistant will never find anything going +50mph while doing there rubway checks!! A situation that should be felt with! Its "ANNUAL" walk???!!!! This should be done every day to ensure the runway is clear.